What's The Most Embarrassing New Car To Drive? One of the perks of being an automotive journalist is the chance to drive new cars. But sometimes Wert has us review vehicles we feel ridiculous driving. What's the most embarrassing new car to drive? Once referred as the electric dork-mobile, the Zap Xebra is one of the reasons people have a negative view of electric cars. It looks like a car that's not yet fully developed. Sort of like a car fetus. Born with only three wheels, a top speed of 45 MPH (after you hack it), and a range of just 40 miles, it's a car even Prius owners make fun of. And the cost of the embarrassment? Just a little over $11,000 to look like an eco-idiot. 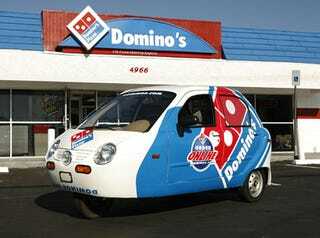 Bonus points if you're using it to deliver pizzas. Luckily Wert's never asked us to review it, but if he did — wow. We don't even know what we'd have to say.